"Chick on a Royal Enfield!" is the title of a highlight photo posted on the Killboy website. Killboy photographers capture pictures of riders on the legendary Tail of the Dragon, U.S. 129 between Deals Gap, N.C. and Tennessee. The road offers 318 curves in only 11 mountainous miles. 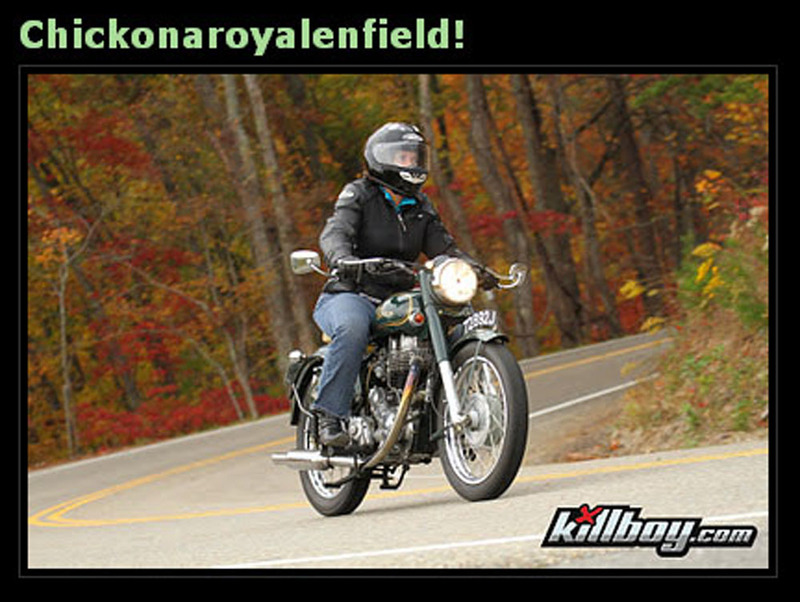 Riders naturally want a picture of themselves leaning into a curve, and Killboy obliges. The best shots go into the "Highlights" section. This "chick" is Leigh Murphy, and the Royal Enfield is her 2005 Royal Enfield Bullet, "Absinthe." 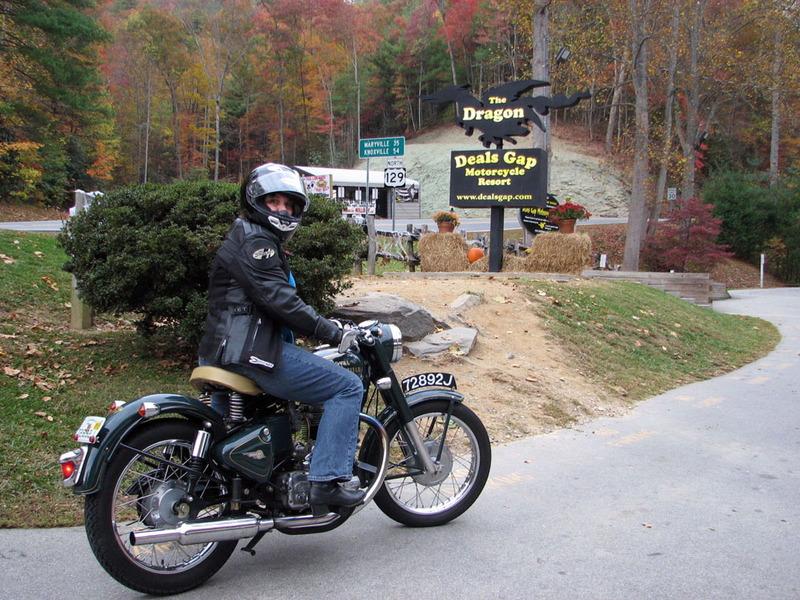 "I was at Deals Gap on Oct. 27 and happily survived a rainy, cold, leaf covered trip through the Dragon on Absinthe!" she writes. "I even encountered two big rigs on the run, too." That's significant and scary. Big trucks are a serious problem on the narrow mountain road, and motorcyclists have created an online petition to ban them. Otherwise, Leigh had no complaints. "The drum brakes and old school tires did just fine. In fact I had a better time with that than the brakes on my Toyota on the way up there with the trailer. Those were smoking by the time I arrived at the south end of the Gap!" Leigh Murphy and Absinthe take on The Dragon. "This is me after going up and back in the persistent light rain. The run had a lot of new fallen leaves, which at least kept all the rocket heads off it. I was wet, cold, and shivering but happy. I didn't realize the official sign was behind me." The Tail of the Dragon is a terrific accomplishment on any motorcycle. Leigh told me in 2010 that "I've never owned a bike before and when I bought this, I'd never even ridden one. I still have a steep learning curve to climb." She climbed it on her Royal Enfield. I'd like to try it sometime, but Fort Lauderdale is a long way from Deals Gap. "Those mountains will be there when you get around to going," Leigh assured me. "I just made myself do it when I happened to have the time (no job) and a little extra cash. I cold camped in my car in the parking area of a sapphire mine in Franklin for $15 a night. The last day I woke up it was 38 degrees in my car. My biggest expense was gas for car and bike." Check out the Tail of the Dragon brochure, here. There are many videos of riders zooming through the 318 curves, but my favorite is this funny, short feature made by the rider of a sport bike caught behind an incredibly slow couple on a cruiser. It gives you a feel for the road and its frustrations.